Keiko Fukuda, who learned judo from its inventor and went on to become the sport’s highest-ranked woman, died on Feb. 9 at her home in San Francisco. She was 99. Her death was confirmed by Shelley Fernandez, who lived with her and helped run Soko Joshi Judo Club, a center of martials, or dojo, in the Noe Valley neighborhood of San Francisco, where Fukuda taught for more than 40 years. Ms. Fukuda was a living link to her sport’s formation. Her grandfather Fukuda Hachinosuke was a Japanese samurai and jujitsu master who died in 1880. One of his last students, Kano Jigoro, began developing judo in the early 1880s as an offshoot of jujitsu, combining balance and strength with holding and throwing techniques. In the early 1930s Kano, as he was known, invited Ms. Fukuda, then 21 and standing less than five feet tall, to join a new judo class for women at the school he founded in Tokyo, called the Kodokan. It was rare for women to learn judo at the time. “At first, all I could think of was how aggressive the maneuvers were and how unusual it was to see women spreading their legs,” Ms. Fukuda told The San Francisco Chronicle in 2011. She grew to love the sport. When she learned she would have to give it up as part of the arranged marriage planned for her, she refused to be married. By the late ’30s, she had become an instructor and developed an expertise in ju-no-kata, a gentler form of judo. She first traveled to the United States in 1953 to teach as a way of honoring Kano, who died in 1938. Ms. Fukuda stayed several years before returning to Tokyo, where she demonstrated women’s judo at the 1964 Summer Olympics. She returned to the United States in 1966 at the invitation of a judo club in California and decided to stay. She eventually became an American citizen. In Japan, Ms. Fukuda had risen to become a fifth-degree black belt, or fifth dan, in the early ’50s. She was one of only a handful of women to achieve the rank, but her progress stopped there for the next 20 years. Ms. Fernandez, a board member of the National Organization for Women, said the male-dominated Kodokan refused to grant her a higher rank until Ms. Fernandez led a petition effort that helped persuade the Kodokan to promote her to sixth dan. She was the first woman to reach that rank. More than 30 years later, in 2006, she progressed through the ranks to become a ninth dan, also called a shihan, the second-highest ranking possible in the sport and the highest rank the Kodokan had ever given a woman. 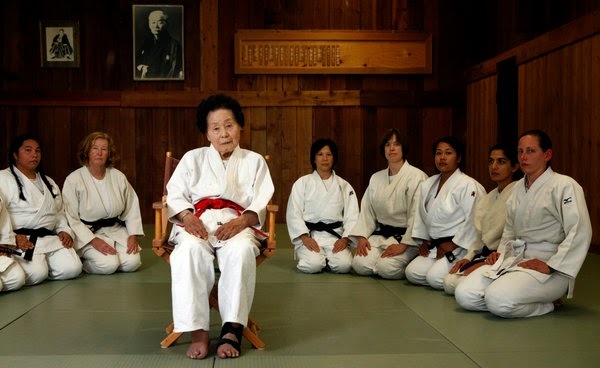 In 2011, when Ms. Fukuda was 98, USA Judo promoted her to 10th dan, the highest level possible. The Kodokan never did. Keiko Fukuda was born on April 12, 1913, in Tokyo. She received a degree in Japanese literature from Showa Women’s University. No immediate family members survive. Ms. Fukuda taught in many countries and wrote two autobiographical books on judo. Last year, she was the subject of a documentary film, “Mrs. Judo,” its title a reflection of her comment that she had committed her life to the sport. Ms. Fernandez, 82, recalled the day in 1966 when Ms. Fukuda visited the dojo in San Francisco where Ms. Fernandez and other women were practicing judo. Most did not know of this diminutive sensei, but they were immediately impressed. Bruce Lee was quoted on NBC's The Blacklist! Happy 50th Birthday Brandon Lee! !